I could hardly wait to get to the barn to install the EquiFit boot holder in my tack locker on Sunday, and I was not disappointed. It's absolutely perfect! 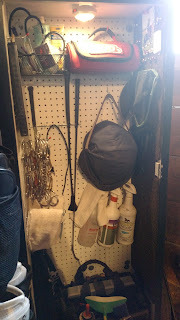 Row from top to bottom: full set of Dressage, full seat of open front leather jump, two pairs of Dressage fronts, full set of XC. My one disappointment is that I can only really use four of the six rows - the sixth row is actually folded behind the organizer here and tacked up with pushpins. 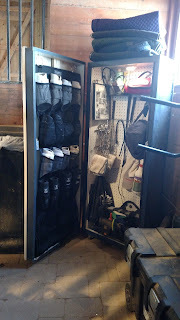 And if I put boots in the fifth row, it pushes against my grooming box and the door doesn't close. But that's a small complaint. 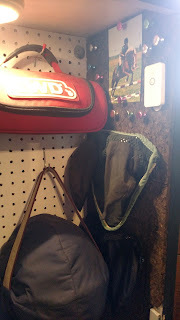 I re-did the cork board entirely on the right side, using thicker, prettier cork tiles and Velcro Command strips. Hopefully these survive the high humidity of the barn in summer, unlike the others. Humidity made them fall down, then the mice chewed them. Sigh. 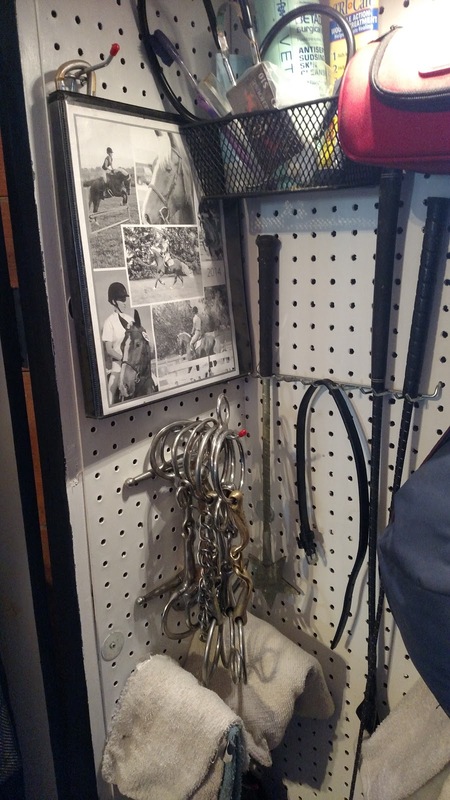 This is not my only trunk - off season things, and things like my farrier tools that I don't use very often live upstairs in the storage loft in a plastic trunk. But everything I need on a daily basis is right here, visible and easy to grab. I could not go back to a trunk after this. Seriously magical. 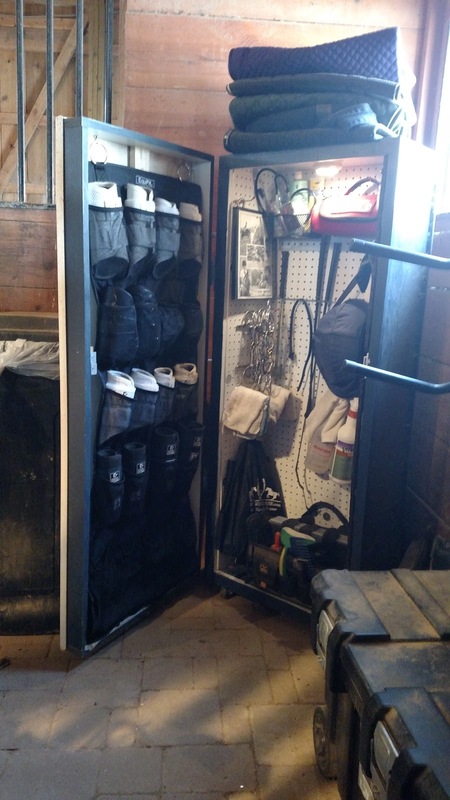 I love uber organized things like this even though I can't do them myself 😂 I'm also envious of your boot collection!! You can do it! Honestly I'm the same way but this locker makes it easy. 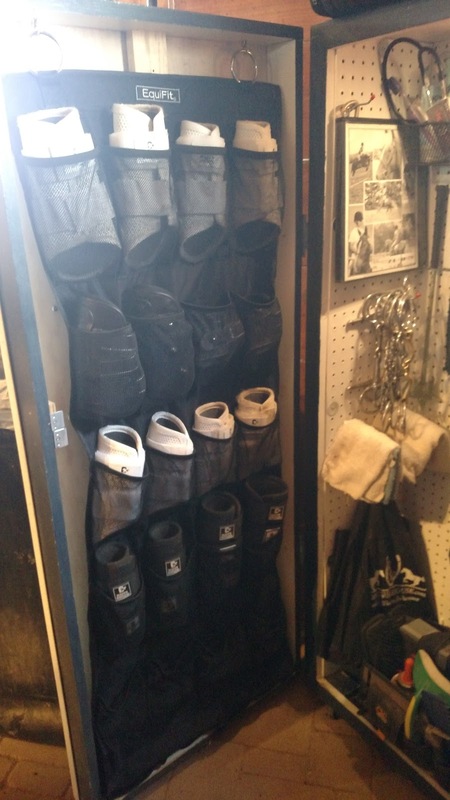 Without shelves or a bottomless pit to drop random stuff in, my only option is to put things exactly where they are supposed to go. Makes it easy. Need to show this to Paul...thinking this may go on his project list! It looks awesome!! Does the door still stay closed with the new weight in the door or will you have to put a latch on it? It's had a magnetic catch since the beginning, so no issues there! This looks AMAZING!!! I want! I want one of these when I grow up!!!! !